Ramallah thumbs nose at US, Israel, as it says 'threats and intimidation' will not work. Chairman of the Palestinian Authority (PA) Mahmoud Abbas briefed officials in Ramallah on Saturday about the progress of ongoing peace talks with Israel. Spokesman Nabil Abu Rudeina stated at Saturday's briefing that Abbas had told US President Barack Obama and US Secretary of State John Kerry, whom Abbas met this week, that he would not yield the right to a Palestinian state - even if they pressured or threatened him, according to Voice of Israel radio. Rudeina also stressed that the PA would not recognize Israel as a Jewish state and announced that the PA demands a just solution to the "Palestinian refugee problem," and a sovereign state with its capital in East Jerusalem - sans "settlers" or an IDF presence. He added a claim that the PA "would still hold the door open" for peace, however. 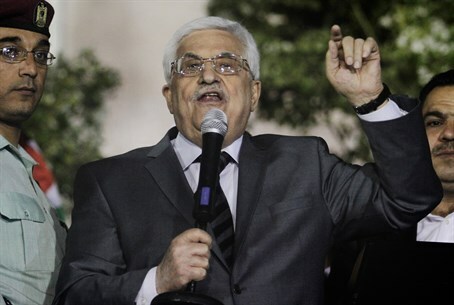 AFP reports Saturday night that Abbas has also threatened to torpedo talks - and take action - if Israel does not release the fourth batch of Palestinian Arab terrorists which was agreed upon as a "gesture" in talks. "We are awaiting the release of the fourth batch of prisoners, as agreed upon with the Israelis through the United States," he told Fatah. "We are saying, if they are not released, this is a violation of the agreement and allows us to act however we see fit within the norms of international agreements." Abbas has consistently said that unless all his preconditions are met, there will be no peace with Israel. The PA has already formally refused to recognize Israel as a Jewish state throughout talks, stating that "the Arab states will never recognize a Jewish state." In addition, the PA Chairman will reportedly only agree to extend talks if Israel allows a "right of return" for Palestinian Arabs, free terrorist leaders, and withdraw from Judea and Samaria. Israel agreed to release 104 terrorist prisoners as a "gesture" to the Palestinian Authority (PA) and a precondition to ongoing peace talks. So far, 78 have been released; the final batch is reportedly due to be released on March 28. The fourth batch of terrorist releases has sparked considerable controversy, as MKs point out that the previous releases have done nothing to further talks, and that several of the released terrorists have contributed to the increase in terror attacks over the past year.